Brand Badger: I'm a Big Kid Now! What do you do if you want to put something out to market that is really unique, not just another me-too product? You do what Kimberly-Clark does time and again: invent your own product category. For nearly 140 years, Kimberly-Clark has been making paper products. Many of their offerings were completely revolutionary at the time they were introduced. For example, K-C invented the paper towel, and they were the first to put toilet paper on a roll. 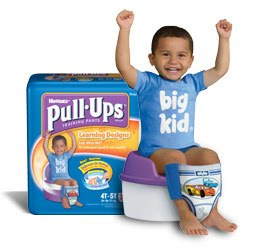 More recently, they introduced Huggies Pull-Ups in 1989. The company has perfectly positioned and marketed these "training pants" as the perfect product for your toddler who is too big for diapers, but not yet ready for underwear. Since the product was launched, Pull-Ups has been a huge success for Kimberly-Clark. Even after copycats came to market, K-C has consistently enjoyed market share topping 60%. They've done this because they created the category and therefore dominate it. When it comes to potty-training, Kimberly-Clark is number 1.